Senior Army leaders recently told lawmakers that the service should be able to release a request for proposal to industry this fall for its next-generation helicopter program. The Army launched its Future Vertical Lift program in 2014 to replace its current fleets of UH-60 Black Hawk, CH-47 Chinook and AH-64 Apache helicopters with sophisticated, rotary-wing aircraft capable of surviving a major conflict with an adversary such as Russia or China. At a recent hearing before the House Appropriations Committee's defense subcommittee, Rep. Mario Diaz-Balart, R-Fla, said he had heard reports that the program could be falling behind schedule. "I have read some conflicting reports on the status of this program," Diaz-Balart said. "I do understand it is included in your 2019 budget, which is great, but I am hoping to get some clarification on the Army's intentions for the program." Army Chief of Staff Gen. Mark Milley said the joint FVL program is high priority for the service and that it is scheduled to move forward this fall. "The request for proposals and all of that is going to be decided sometime in the early fall, so it is on track to meet those timelines," he said. Milley said the current Black Hawks, Chinooks and Apaches are "great helicopters," and the Army is going to continue to "invest in those in the foreseeable future." "But the future operating environment is going to be significantly different, we think, especially if it's against a near-peer competitor," he said. "So we need an aircraft that can, first, survive; we also need an aircraft that is dual-purposed so it can both be manned and possibly autonomous and unmanned, a robotic helicopter. "We need an aircraft that can fly faster and further than any existing rotary-wing aircraft today," Milley said, "and we need an aircraft that is agile both while in flight, to avoid anti-air defense, and at the landing zone in order to evade and survive any of the intense ground fire that will be coming on a hot LZ." Milley acknowledged that the Army has laid out "pretty stiff requirements" for the program and that industry is heavily involved in the process. The Army is the only service that has not bought Bell Helicopter's V-22 Osprey tilt-rotor aircraft. It opted out when the Marine Corps decided to buy the Ospreys, which were designed in the 1980s. Committed to the FVL concept, the Army selected two firms to develop demonstrators in 2014. 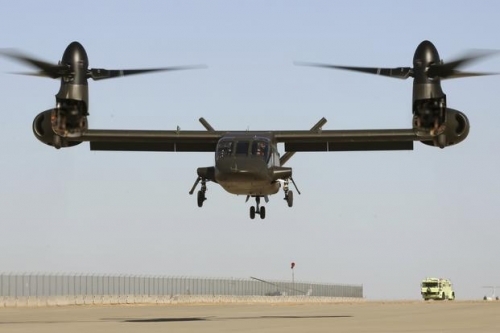 Textron Inc.'s Bell Helicopter created the V-280 Valor, which completed its first test flight in December. Sikorsky, part of Lockheed Martin Corp., and Boeing Co. built the SB>1 Defiant, a medium-lift chopper based on Sikorsky's X2 coaxial design. "What we are doing right now reflects the different approach to acquisition that we are taking," Army Secretary Mark Esper said. "In this case, we have two demonstrators. One has flown, I think; the other will be flying later. Both are largely funded by industry as prototypes with some federal dollars," he said. "It just reflects a whole new approach where we prototype, we test, we fail, we learn, we prototype and we repeat until we narrow the requirements, and we get on a much quicker trajectory to get to the end-state that we want." Milley said the Army will "know more throughout the summer and as we get into the fall to make some hard decisions." "But there is no intent, and the secretary and I are not going, to stand for delays," he said. "If you think about what an Army does, an Army fights and wins in ground combat," Milley said. "The first thing they have to be able to do is to shoot ... then you've got to be able to move, and we move by the ground and we move by the air, so this is a very important priority for the Army. "We are committed to it, and we are going to try and keep this thing on track," he said.